Gone to See America 2008: Wintertime in Rocky Mountain National Park. One of the benefits when I was working part-time (two weeks a month) in Boulder, Colorado was that Rocky Mountain National Park was only an hour drive. I got to see and take pictures in the park during all four seasons. A winter storm was approaching, so I only spent a few hours in the park. I miss not working part-time in Boulder, Colorado. While there I was able to visit Rocky Mountain National Park all seasons of the year. 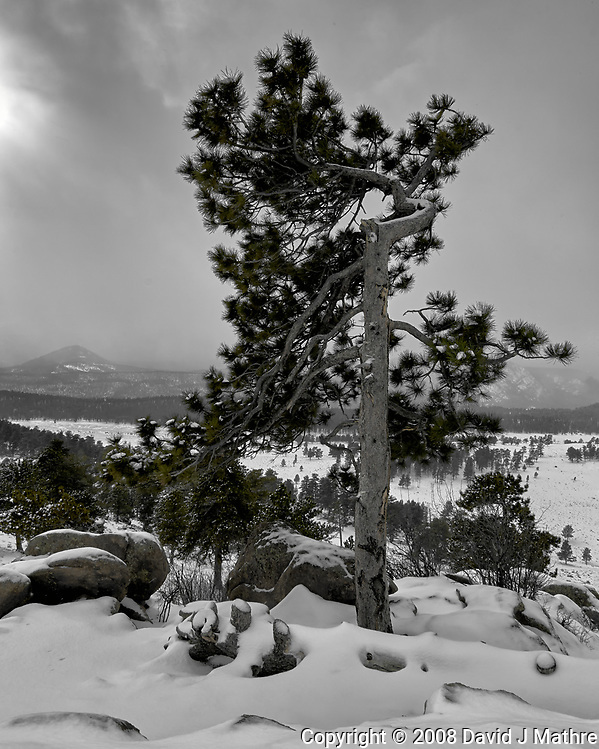 As long as the roads were clear, it was only an hour drive from Boulder to the park. Some of these images were published ten-years ago, and some are new. All have been reprocessed using newer software. I was about to leave for a hike in Rocky Mountain National Park and saw this brown bird with spots outside the Residence Inn where I was staying in Boulder. I got a couple of pictures, but didn’t know what it was at the time. I finally figured out that it was a Norther Flicker. A woodpecker that feeds on the ground. I then went for a hike in the Longs Peak section of Rocky Mountain National Park. A few images — a squirrel, a small white wildflower, and a purple crocus wildflower. Many more images for another day. I went for a hike on the Wild Basin Trail in Rocky Mountain National Park. Lots of wildflowers, and this stupid bumblebee that liked my carbon fiber tripod. I spent the day in and around Rocky Mountain National Park. Trail Ridge Road (U.S. 34) was open. This highway crosses the continental divide, and is generally closed due to snow between October and May. This year I saw a note that it would not be open for Memorial Day weekend due to a late season storm. During the day I took over 600 images. I selected images of birds (Black-billed Magpies and Red Crossbills), mammals (Chipmunks, Elk, and Moose), plants & flowers, and landscapes for the following slideshows. 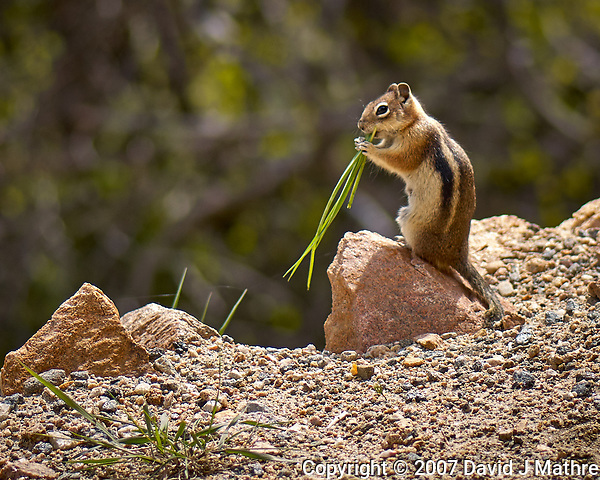 My favoriate image of the day was a chipmunk chewing on some grass. I would like feedback regarding presenting the images as slideshows. Note that you can click below the slideshow to stop, start and to see titles. By clicking on an image you go to the image gallery where images can be downloaded and prints can be ordered.